The press lounge always offers free coffee and, this year, it's stocked with Star Wars-themed Coffee-Mate. The bottle of Espresso Chocolate is illustrated with Darth Vader art; Spiced Latte bears Chewbacca's image; and Italian Sweet Crème is paired with Boba Fett. The flavors don’t quite correspond with the characters, but who else would you pick to be on Espresso Chocolate? This one makes perfect sense. Especially for those of us with a certain brand of phone that has a very, very short battery life. AT&T is winning the day with its Fortress of Rechargitude. The company set up charging stations and a comfy seating area facing large flatscreen TVs. There is, of course, a line to enter the Fortress. Other companies have opened charging stations, but none excell quite as well as AT&T. Because if you have to charge your phone at Comic Con, you might as well do it while watching TV. Netflix is getting ready to release its new series Jessica Jones, based on a Marvel comic, on Nov. 20, and marketers made sure the show was everywhere at Comic Con. 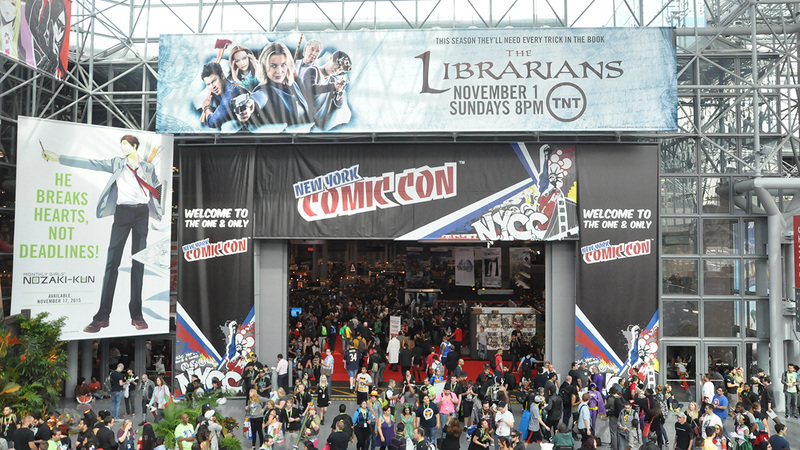 The sidewalks on the way to the Javits Center in New York are spray-painted with the Jessica Jones hashtag, fans get free posters at the Marvel booth and the event's biggest line leads to a GIF photo booth resembling the character's office. The fake door to the office reads "Alias Investigation," and the desk is cluttered with things a private eye might use: a digital camera, files, a newspaper and a computer. And people working at the booth have encouraged attendees to play around with the props. The photo booth takes four photos in rapid succession and turns them into a GIF—and as an added bonus, it gives you a print of your final frame. Back to the Future Day is coming—and for real this time. Oct. 21 is the date Marty McFly goes into the future, or the date he goes back to the future in Back to the Future II. In honor of this, Pepsi created Pepsi Perfect, the drink Marty finds when he travels through time. To promote the special bottles at Comic Con, the soda maker is bringing the movie to life in an area designed to look like Marty's world, complete with actors dressed as Marty McFly and Doc posing in front of the iconic DeLorean. The futuristic display is capturing a lot of attention through old-fashioned nostalgia. There are more than a few ways to enter the floor. But one of the larger entrances is marked with the giant arches you see in Jurassic Park movies. The theme song plays on a loop, a few plants adorn the archway and a movie rep is handing out free Jurassic Park buttons to all who enter. To up the ante, a performer (we assume) in a raptor costume puts on a little show for guests. The raptor noises and swinging tail drew a surprisingly large crowd on Friday.